Today on Poster Monday we feature Little ‘blind’ Billy in Concert designed by Pierre-Paul Pariseau, a Montreal based graphic designer. Born in Canada, Pierre is a self-taugh illustrator working for a wide range of international clients. His work has been exhibited regularly, internationally. 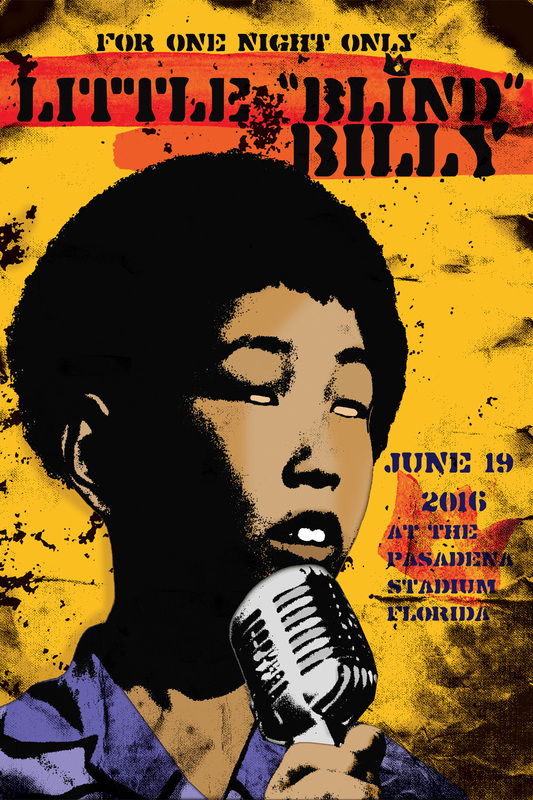 This poster has been created about a fictitious young blues singer that is blind. Little “Blind” Billy is a young man that, from a young age, was inspired by the blues of the south, his native land. He was born blind. He became a legend in his own time. The poster is presenting one of his last concert, one night only but a memorable night. Little “Blind” Billy died not long after this concert from a plane crash. Evoking currents of surrealism and pop art, the creative work of Pariseau invites us into a world of images where everything is possible. From his fusion of collage and digital medium; from his visual articulation of thoughts, moods and emotions, emanates dreamlike scenes, strange theatrical dramas while remaining intriguingly accessible. Happy coincidences, anecdotal events inspire the artist in a fantasy that translates into images made of vibrant colors, stunning juxtapositions and hypnotic reveries that are always compelling. His anthropomorphic creations seem to request storytelling but never impose one. Here the creatures are sentient beings, with emotions and personality. If you would like to learn more from Pierre-Paul Pariseau and his work visit his studio web page.